Have any of you ever wanted to work in a museum? Have you returned home from your visits to historic sites wondering what happens behind closed doors? What do employees at Banting House National Historic Site of Canada do during the mornings when the museum is closed? Let me take you behind the scenes! As Banting House’s newest staff member, I feel like I have a lot to learn. The museum itself is full of amazing artifacts and surprising stories. There’s so much about Major Sir Frederick Banting, M.C. that I never knew! (Did you know that Banting was a skilled amateur painter, who had a personal relationship with members of the Group of Seven? Or that he was awarded the Military Cross for his service during the First World War?) However, there’s even more material at Banting House that has yet to be put on display. This material is stored in our archive. 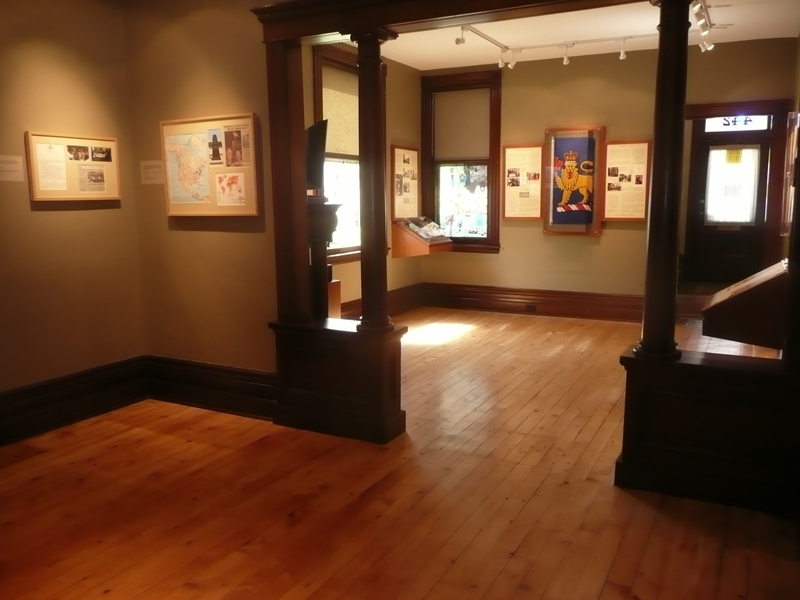 The first of many galleries that took me through the story of Frederick Banting and Banting House. I got a one-on-one tour of the museum during my first day as an employee here. Perhaps the most exciting task I’ve been given in my first week was to create an inventory of a new donation of letters and artifacts. Creating a list may not sound very interesting, but that changes when you get to handle WWII-era newspapers, old photo slides, and letters from Banting and people who knew him. It’s also great to see that we are getting new items from generous donors. Once they’ve been catalogued, we can store these items safely and ensure that they will provide material for research and exhibits for generations to come. What are you going to do to support World Diabetes Day? We’d love to hear from you, and to see you at Banting House on November 14th! If you’re looking for ways to take a step for diabetes, why don’t you start by looking here? This blog was posted by Stacey Devlin, graduate research assistant at Banting House NHSC. Stacey Devlin is an M.A. candidate in Public History at the University of Western Ontario. Posted in Behind the Scenes at Banting House.Tagged Artifacts, Banting, Collection, Diabetes, Events, Museums, World Diabetes Day.